My friend on Facebook are posting pictures of their kids playing in the snow and I really wish my kids were doing the same thing. However, Mark cannot stand the snow and the girls complain about the cold after 30 minutes. I know part of the problem is our lack of snow clothes. Why would I buy snow clothes for the once a year snow storm? Today is our fourth snow day and I'm officially going crazy and the kids have taken the trip with me! These snow days are making me a little slow too. Turns out, staying indoors with 3 young kids is mentally draining. I realized yesterday just how far I've fallen when I didn't put two and two together in time. Adding insult to injury my twins haven't napped this week. I try to get them to rest for about an hour so I can get some downtime. Today was a total failure and I let them out of bed early. Isabella asked if they could have an apple for snack. I said yes of course and went back to my work on the computer. I love that my kids are old enough to get an apple and a drink without my help. A few minutes later Isabella announced they were going bowling. I didn't even look up and said "uh huh." Later I heard a strange sound making my neck hair perk up. The only thing worse than silence when you have kids is a strange noise. I turned the corner right as my youngest rolled her apple down the hall. 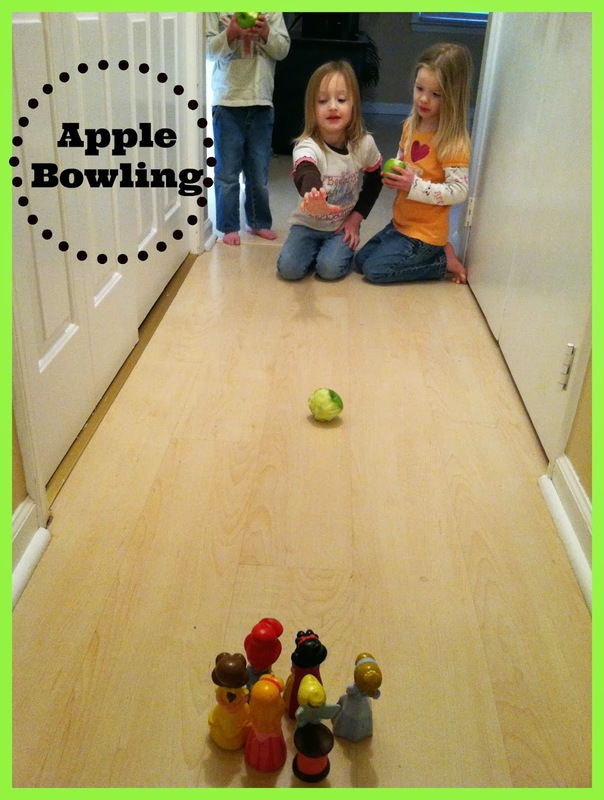 Slowly I begin to put it all together, my kids created apple bowling. Grab some princesses and set them up as the pins. Take your partially eaten apple and roll or throw it as the bowling ball. The best part is, you can eat your apple while you wait for your turn. I thought about stopping this game for half a second but then I realized that they were having fun and I decided to take some pictures and join them for a game. Now I don't want to brag but I rock at apple bowling! I took those princesses down! After playing for 20 minutes all the apples were down to the cores and the game was over. I will admit that this game is far outside of my neat freak comfort zone. But it felt good to relax and enjoy the moment without worrying about the mess or how dirty the apples were getting. Everyone was stressed out from too many days stuck inside and being on top of each other. After our bowling game we were all happy and we had a better afternoon than we've had all week. I need to let loose more often. Don't worry I mopped the hallway once the game was over. I'm going stir crazy not changing my personality. How fun! Plus you have a healthy snack at the end lol! Yep! It really was a win/win situation. What a fun yet simple idea! It was fun! It's snowing again today and it looks like the kids will be out of school for the rest of the week. I see another game in our future.